We love the looks of the latest incarnation of the Dell Inspiron 15, as urprisingly powerful low-cost laptop with a 15.6in screen. Both the inside and the outside of the chassis are decorated in a scaled pattern of textured black triangles. The result feels durable, it is resistant to smears and fingerprints and looks great. The laptop is a little thicker and bulkier than some similarly-priced rivals, but it has the features to justify the extra size, including a numeric keypad, a generous 750GB hard disk and a DVD writer. The screen looks good from a wide range of viewing angles and the hinge feels particularly sturdy. It has a standard laptop resolution of 1,366x768; unlike many recent laptops, the Inspiron 15 doesn't have a touchscreen, but it has a bright, high quality display with a gloss finish that makes colours seem more intense. However, like most glossy displays, it is rather reflective, particularly if you have a strong light source behind you. The keyboard is excellent. It has flat, widely spaced Chiclet-style keys which, like most of their kind, don't have a huge amount of travel. However, their layout - including that of the number pad and arrow keys - lends itself to swift and reasonably accurate touch typing. The touchpad has two buttons below it rather than being of the increasingly common type where the buttons are built into the touchpad. Some users prefer dedicated buttons, finding them easier to use with accuracy. The touchpad is slightly offset from the centre of the laptop but there's still plenty of space on the wrist rest for both your hands. However, the wrist rest appears to be over the processor or some other heat-generating part, as it becomes slightly warm after even brief use. The laptop is more powerful than many at this price, thanks to an Intel Ivy Bridge Core i5-3337U processor. It's a dual-core CPU which runs at 1.8GHz and produced a respectable overall score of 45 in our application benchmarks. 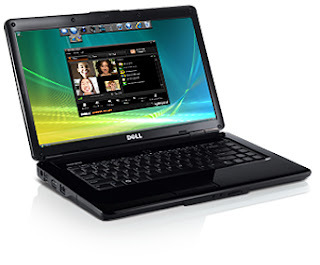 The laptop is also equipped with 6GB of RAM, making it well equipped to handle any application you need to run. The only area where this processor may not be particularly suitable is for high-definition video editing; as it only has two cores rather than the four found on more expensive chips, it may struggle with complicated video previews and when encoding video to a different format. The integrated Intel HD Graphics 4000 on-chip GPU isn't much good for modern games, it will play older games such as Half-Life 2 and Left 4 Dead 2, but if you want to play the latest titles you should look elsewhere, to laptops with dedicated graphics chipsets such as Dell's own Inspiron 17 or the Acer Timeline U M5-581TG. The Inspiron 15's battery life is excellent, as it lasted for almost nine hours in our tests. This is definitely a laptop that you could use all day without worrying about running out of power. The laptop has four USB ports, which is useful, but unfortunately none are USB 3 for attaching super-fast external storage. There's a headset port which can also be connected to stereo headphones or speakers, and HDMI output which can be used to connect the laptop to an external display - handy if you want to view Full HD content at its proper resolution - and a Gigabit Ethernet port. The integrated speaker sounds tinny but has reasonably clear sound. Dell's latest Inspiron 15 is an extremely powerful and well equipped laptop for £400. While it's not particularly svelte, nor is it as powerful as MSI's £570 CX61, it's still a superb all-round laptop and a Best Buy.